" Planetary Configuration for Happy Married Life "
Marriage is an institution for continuance of mankind. A happy marriage creates opportunities for material and spiritual growth. The most active life of a person is between 25 to 50 years when one is fit and ready to do anything with zeal for promoting not only his own generation but for the growth of the society and the world at large. The marriage partner becomes one's natural ally and provides the latter with opportunity to confide in, to be heard, counsel and to plan for the future besides catering to his/her physical needs without any selfish consideration. The attainments of one's life are solely dependent upon one's successful and happy married life. The happiness in marital life depends upon the mutual trust, good health of the couple, their understanding, birth of children, post marital material prosperity and spiritualistic initiation. The mutual trust is generated by benefic influence on the planets becoming significators for the marriage and the absence of the afflicting influence of the functionally malefic planets. The good health of the couple is ruled by the lords of the first and seventh houses besides the significators of marriage and the Sun, the significator for vitality. The birth of children is dependent upon a strong lord of the fifth house, Jupiter and the lord of the second house. Post marital prosperity and the spiritual development depend upon the operation of the periods of the functional benefic, well-placed and strong planets. 1) Strong, well-placed and unafflicted lords of the ascendant and the seventh house who bless the couple with good health and long lease of married life. 2) A strong, well-placed and unafflicted significator for marriage partner. For example, Jupiter for the husband and Venus for the wife. 3) A strong, unafflicted and well-placed lord of the second house which rules the family and the continuance of the family line. It not only strengthens the marital bond but also blesses the native with male progeny, sought after universally. (4) A strong, well-placed and unafflicted lord of the fourth house ruling domestic peace and marital harmony. (5) A strong, well-placed, well-aspected, unafflicted and unafflicting lord of the eighth house ruling the marital tie. (6) A strong, well-placed, well-aspected, unafflicted and unafflicting lord of the twelfth house ruling comforts of bed and good sleep. A weak lord of the twelfth house and afflictions to the twelfth house or its lord cause separation between the married partners resulting in loss of bed comforts and sound and peaceful sleep. Whenever, there is no mooltrikona sign in the seventh house, the significator for the husband/wife becomes the prime determinant. A strong planetary configuration gives a timely, happy and fulfilling married life. The lord of the seventh house, though in the state of infancy, is placed in the seventh house. The Moon, the functional benefic is closely conjunct with the mid-point of the seventh house. The significator for the wife and the lord of the ascendant, Venus, is closely conjunct with the mid-point of the ninth house, ruling fortune. The functional malefics, Rahu, Ketu and Mercury do not form any close affliction in the chart. The lord of the twelfth house is weak due to its being in the state of debilitation. The functional benefics Saturn, the Sun and Jupiter, though weak due to debilitation in navamsa, are well-placed. The good combinations conferred status, timely marriage, a son and a daughter, happy married life, movable and immovable assets, name and fame in life. The native was a senior army officer and the weakness of the lord of the twelfth house could only disturb the bed comforts occasionally when the native was posted to a non-family station. The lord of the seventh house is well-placed and is in close conjunction with the significator for wife, Venus, in the tenth house. The functional malefics do not cause any close affliction to the lord of the seventh house and the significator. The second, fourth and twelfth houses do not contain a mooltrikona sign. The lord of the eighth house is well-placed and strong and does not cause any affliction. This is good for the continuance of the marital tie. 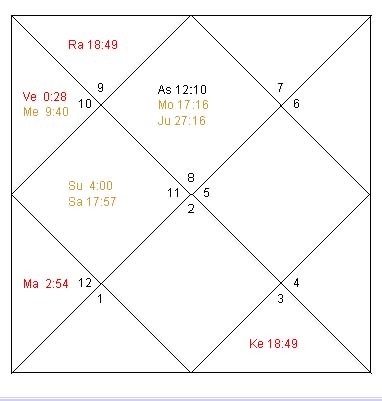 The only close affliction in the chart is that of Ketu to the mid-point of the seventh house, the impact of which is mostly bearable due to the well-placed and well-associated lord of the seventh house. The native is enjoying a happy married life and has been blessed with progeny and prosperity. The native enjoys good status with the state government due to a strong Saturn placed in the second house which is closely aspected by another functional benefic planet, Mars. The functional malefics Venus, Mars and Rahu do not form any afflictions in the chart. Ketu aspects and causes some amount of affliction to the well-placed lord of the fourth house, Saturn, occupying the fourth house. The functional benefics, the Sun, the Moon, Jupiter and Mercury, are well-placed. Saturn powerfully aspects the weak Moon. The lord of the eleventh house ruling income and friends has a beneficial aspect to the house of fortune. The native enjoyed good status with the government, happiness on account of a long married life, male progeny, prosperity and social respect. The lord of the second house is well-placed. The significator for the wife is slightly weak due to its being in the state of infancy. But lack of severe afflictions did not produce any long lasting unfavorable results. The lord and significator of the seventh house is closely conjunct with the lord of the ascendant placed in the second house and does not suffer from any affliction. The lord of the fourth, the Moon, occupies own house in strength and is unafflicted. The lord of the fifth house, though in the state of infancy, influences the nativity, as it is closely conjunct with the mid-point of the ascendant in its sign of exaltation. This blessed the native with senior position in a government organization, happy married life, progeny, prosperity, etc. The weakness of Saturn and Jupiter and affliction to the lord of ninth house, however, kept the level of prosperity low. The weakness of Mercury created occasional mental tensions and loss of peaceful sleep due to official exigencies. There is no mooltrikona sign in the seventh house. The significator for wife is well-placed but debilitated in navamsa. Venus and Mars do not form any close afflictions in the chart. The lord of the fourth house powerfully occupies the fourth house. The well-placed and strong Sun is afflicted closely by Rahu-Ketu axis. In such circumstances, the native feels tension with regard to the significations of such a planet and with regard to the significations of the house which contains the mooltrikona sign of the said planet. The strength and good placement of the lords of the second and fourth houses blessed him with a long-lived happy married life. The native was blessed with male progeny, prosperity, movable and immovable assets and social respect. The affliction to the Sun either results in a non-governmental assignment or of losing such an assignment because of tension developed due to following corrupt practices in the matter of discharge of one's duty. The functional malefics do not form close afflictions in the nativity. The lord of the seventh house is weak but the significator, Venus, is well-placed and well-associated with Mercury. The lord of the second house is closely conjunct with the lord of the eleventh house. The Sun and Saturn are closely conjunct with each other and indicate good professional growth with short-lived occasional problems due to malefic transit influence on the combust Saturn. Similarly, transit afflictions to Jupiter indicate short-lived health problems to the wife and the children of the native. The strong lords of the second house, fourth house and well-placed significator of the seventh house, besides unafflicted lord of the seventh house, blessed the native with a happy and long married life, prosperity, good status in a governmental organization, etc.